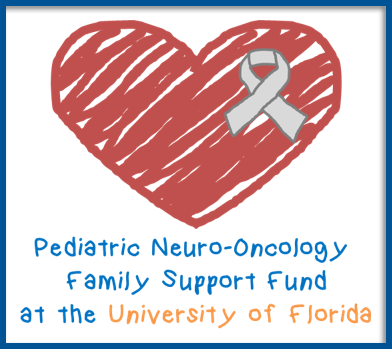 All Neurological Surgery physicians at the University of Florida treat patients with chiari malformation. Chiari malformations constitute a group of anatomic anomalies that involve the brainstem and cerebellum. constitutes descent of the cerebellar tonsils through the foramen magnum (hole in the base of the skull) into the upper cervical canal. Chiari I malformations are associated with a high incidence of skeletal abnormalities of the cervical spine and cranio-vertebral junction. These include basilar impression, atlanto-occipital fusion, and Klippel-Feil syndrome. 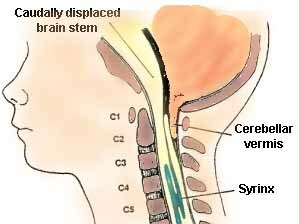 Often there is associated hydromyelia (a dilated fluid cavity in the spinal cord) with Chiari I.
malformations constitute descent of the inferior vermis and cerebellar hemispheres through the foramen magnum with a displacement of the brainstem. This is the most frequent form of Chiari malformation, also named the Arnold-Chiari malformation. It is associated with spina bifida and hydrocephalus is present in more than 70% of cases. malformation is characterized by a downward displacement of the medulla and herniation of part of the cerebellum in an occipital, cervical or occipital-cervical meningocele. Sometimes part of the hindbrain is also herniated. This is associated with hydrocephalus half the time. is the least frequent form of Chiari malformation, characterized by a lack of growth of the cerebellar hemispheres. The symptoms and signs of a Chiari malformation are related to the compression of the brainstem caused by displacement of the cerebellar tonsils and hindbrain. The most common symptom is headache, which is occurs in the back of the head and the neck, and is increased by coughing or sneezing. In infants and children, headaches may manifest as irritability or crying, and the pain may be associated with arching of the neck in a hyperextended posture. Depending on the type of Chiari malformation, symptoms may begin in infancy, childhood, or adulthood. Chiari I is usually seen in adults. Chiari II is commonly diagnosed in children. Symptoms from the associated hydromyelia can include weakness and numbness in the hands and arms. If untreated, this can progress to severe weakness and atrophy of the arms, sensory loss, and spasticity of the legs. Symptoms of progressive brain impairment may include dizziness, an impaired ability to coordinate movement, double vision, and involuntary, rapid, downward eye movements. A thorough history and physical, including an extensive neurological examination, is the first step in diagnosing Chiari malformation. MRI studies of the brain and cervical spine provide the most accurate method of diagnosing Chiari malformation and/or hydromyelia. The treatment of Chiari Malformation and associated anomalies is controversial because of incomplete understanding of the pathogenesis of this condition. The most common treatment involves decompression of the malformation by removing the overlying bone. This is called a subocciptal craniectomy and upper cervical laminectomy. The procedure involves an incision in the back of the head and neck to expose the skull and cervical spine. Part of the base of the skull (foramen magnum) and the back (lamina) of the upper cervical vertebrae are removed to create extra room for the displaced brain. The covering over the brain, called the dura, may also be opened and enlarged with a patch graft. This generally relieves any pressure on the brainstem and restores normal cerebrospinal fluid flow.